Simba kaOne! is the chant in the run up to Saturday. Simba One Time! It is most likely that the vote will lead to a run-off for the presidential election between the final two candidates. Simba kaOne! is a battle-cry for a landslide victory by the Makoni campaign and a New Dawn (Mavambo) for Zimbabwean politics, but the struggle for first place will probably continue with a run-off in another three weeks. Which two will remain in the game is the big question. Makoni’s Harare rally was postponed from morning to afternoon, and then to the next day. Rumour has it there are security risks. His rallies outside of town have met with more hostility than the relatively calm urban centres. In fact, ZANU supporters are not to be seen in town at all. 2005’s Murambatsvina (Operation Clean up) made winning back the urban vote impossible and the ruling party is focusing its attention on the 70% rural electorate. Outside the city, ZANU food hand-outs are scheduled at the same time as Makoni rallies and road blocks make rural canvassing difficult. In the city, everyone is desperate to catch a glimpse of the Golden Boy. Tuesday’s rally will be the last real chance before campaigning ends. Today Fay Chung supported a rally of the indomitable Margaret Dongo. 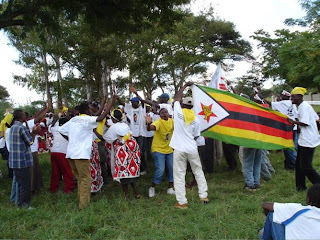 Dongo is an outspoken ZANU war-vet who famously broke from the party in 1995 and, to ZANU’s shock and amazement, won her seat in Sunningdale as an independent candidate. She was Zimbabwe’s first independent MP and the first female leader of a political party. She speaks passionately about how women have a far greater role to play within our patriarchal society and lives by her word. A truly original character, it is her precedent that Makoni is following as a brave stand-alone candidate without a party. If he wins he’ll be the first president in recent history to win a campaign without a political party! Simba kaOne! Regular readers of this blog will have noticed that we sometimes experience a delay between the writing of the field reports in Zimbabwe and their posting online. This is caused by some email delays and other issues. So, to make things as clear as possible what we now do is post each report as they come in and also include a report date in the text. This indicates the day the post was actually written. There are five more days before African democracy is tested in Zimbabwe. Anyone with experience of politics in Zimbabwe will tell you that democracy in a run up to elections comes down to T-shirts. A campaign cannot run without the ubiquitous T-shirt, with the candidates face plastered on the front. At every site the request is repeated ad nauseum, “Can I have a T-shirt?” Beware the naive candidate who opens their car boot – they risk a riot of violent looting and crowds wrestling over the precious items. The local T-shirt making factory has been open all weekend printing shirts for ZANU, MDC, Makoni. The most precious ones at this point must be Mugabe’s stern portrait emblazoned “Fist of Fury” – hopefully this T-shirt will soon be a collector’s item, a little piece of African history. The Fay Chung Senatorial Campaign Team prepare for the Saturday election: Mvurachena includes over fifty polling stations within a vast urban expanse. The upshot of Makoni’s entry into the ‘harmonized election’ is that voters will have a wide choice for their various ballots, with the option of choosing MPs, senators and presidential candidates from varying parties at the same time. The concept is refreshing after years of no real choice. Polling-agents from four different parties (ZANU, MDC1, MDC2 and Simba’s Movambo movement) will be present to ensure that rigging does not take place. This is a first for Zimbabwean elections, which have previously had only one opposition polling-agent observing the voting. Fears are still high that the vote will be stolen in the chaos, but the Zimbabwe Electoral Commission (ZEC) has assured the candidates that the presidential count will be presented outside each polling station as soon as counting is done. No matter how well things are prepared, chaos and surprises are predicted for the big day.